These are the thoughts that should come to mind when thinking of Equilibrium: melodic, grandiose, awe-inspiring, uplifting, epic. While all of the band's albums vary from each other in sound, they all remain home to the previously listed adjectives. 2005's Turis Fratyr took on a more atmospheric, nature-themed tone, and was overall the least hard-hitting as a metal album. 2008's Sagas, the band's widely regarded opus, felt like a soundtrack to the greatest battle of all time; it was also faster and heavier than its predecessor. 2010's Rekreatur was then even faster and heavier than Sagas but went lighter on the folk influences and heavier on the orchestrations. 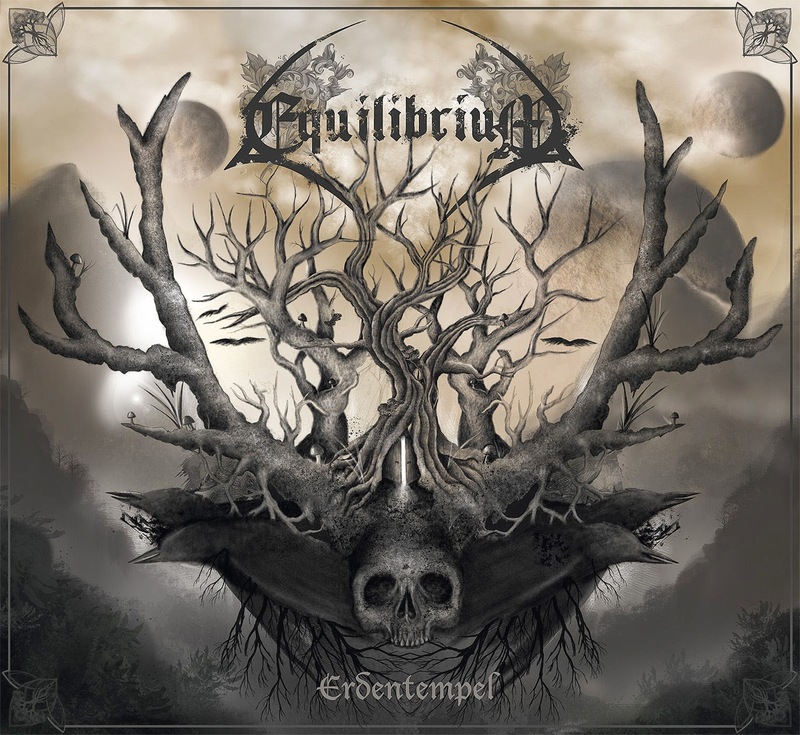 The only release we've seen from Equilibrium since Rekreatur has been 2013's Waldschrein EP, a little disc consisting of an original song, an unreleased demo, a cover, and a remake. The original track upped the folk influences back into absolute full swing. The song was also fairly simple, but still trademark Equilibrium, as it maintained the grandiosity that the band is known for. Waldschrein wasn't enough evidence to go by so it left fans wondering what 2014's LP would bring. Erdentempel continues exactly where Waldschrein left off. The folk aspect is the highest its ever been in the band's career, the songs all short and simple in structure. But as always Equilibrium sounds like Equilibrium. This album is melodic, grandiose, awe-inspiring, uplifting, and epic. And again as always, Erdentempel packs the expected Equilibrium punch, but with a unique tinge of its own. The tinge this time isn't based around atmosphere, battle anthems, or what have you. Erdentempel takes on one goal and achieves it nearly flawlessly. That goal was to create an album filled with simple and easily digestible tracks, each being able to stand on its own. That is, without the need for the rest of the album's context; you can listen to and fully enjoy and given track. This is the first Equilibrium album I feel completely satisfied listening to on shuffle. As for the music itself: for one it's again the folkiest stuff we've seen from the band. The overarching element this time is energetic, fun, and happy sounding music. But more importantly, the album is chock full of catchy hooks and melodies, some of them downright infectious. Be it Karawane's pounding chorus, Uns'rer Flöten Klang's knee-slapping lead and almost "barnyard-sounding"instrumental break, or The Unknown Episode's anthemic sing-along vocal delivery--there are some seriously gratifying moments on Erdentempel. You are bound to find yourself coming back to certain tracks, if not to the entire album. This is because one of the main joys of Erdentempel lies in its consistency. There isn't a bad track on it, and though there are some that stand far above the rest, almost every one is unique. The only way I can foresee disappointment with Erdentempel is if people are going in with expectations. If you are expecting, or better yet yearning for an experience that a previous Equilibrium album offered, you will surely be disappointed. What Erdentempel satisfies as is a romp of an album containing an onslaught of catchy, uplifting folk melodies. No, it's not the most complicated or challenging of epic metal albums, but damn if it isn't one of the funnest listens out there. Must-hear tracks: Was Lange Währt, Uns'rer Flöten Klang, The Unknown Episode, Waldschrein.